Passing a live assessment means a lot more than removing the word beta from the top of each screen. As this final exemplar takes its place with our 3 other live services from the government's Digital Transformation programme, it will offer a number of important benefits to users. In this instance, we’re helping people who think they’ve been unfairly treated at work to apply to an employment tribunal. This can often be difficult and stressful so it was vital that the service was clear and simple to use. The team developed a set of questions and interactions that were tested thoroughly with users and then iterated to help them get through the service as easily as possible. 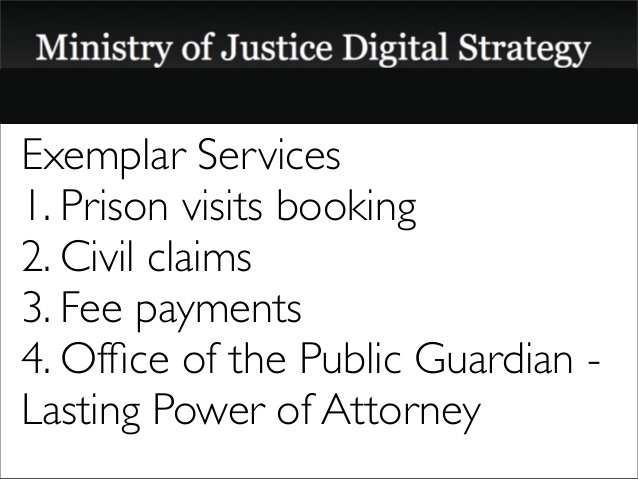 The 4 MOJ exemplar services as they were set out in our digital strategy: 1. Prison visits booking; 2. Civil claims; 3. [Employment tribunal] fee payments; 4. Office of the Public Guardian - lasting powers of attorney. It’s too early to publish reliable performance data but one important piece of functionality we introduced was a ‘save and return’ option. This recognises the fact that people may need to take breaks and get additional information before they can complete their application. Over 30% of users are now using this new feature so we’re confident it will lead to high satisfaction and completion rates. We’ll keep you posted on progress. Delivering this final exemplar service also means a great deal to us at MOJ Digital. Although I’ve only been here a short while, it seems to me that the whole MOJ ‘family’ should be proud of working together to deliver these innovative services. It’s been almost 2 years since government announced its plans to build digital services so good that people prefer to use them - as part of the Digital Transformation programme. We committed to delivering 4 exemplar projects and set up the MOJ Digital team to achieve this. The hard work hasn’t stopped with this final exemplar going live. As well as continually monitoring and enhancing these 4 services, there are many other projects we’re working on for our agencies. And we’re already looking to the future as MOJ Digital has now started to focus on how we will support Government as a Platform. We know that focusing on user needs will improve the way we deliver our services, ensuring that we make a palpable difference to people’s lives. We now need to understand how we can use the approaches taken over the last 2 years to join our often disconnected processes and build a digital justice system that’s better for everyone. MOJ, you are the first department to reach this milestone of having all of your exemplar services live - a fantastic achievement. Congratulations to all involved in MOJ Digital and thanks for your hard work from all of us at GDS. Thanks Mary! Much appreciated. And thanks to those at GDS who have supported us along the way.